chris chandler : The Muse and Whirled Retort 2012 : A special 12-12-12 Edition of T.H.E. .M.U.S.E. .A.N.D. .W.H.I.R.L.ED... R.E.T.O.R.T. Ya know why sound men only count to two? Because on three you have to lift. It's that time of the year again. 12-12-12. But if I were a betting man - I would lay twelve to one odds agains it. 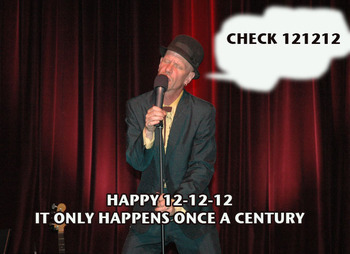 It is 12-12-12 after all. ...lets start with just what an obsessive compulsive neat freak she is. Look at the way she divides herself. Only twelve (and her multiples) can be divided so perfectly. In half and in quarters AND thirds... Oh, and sixths too. She kind of looks down her nose at the empirical ruling ten and all her divisive inadequacies. This is why so much wheeling and dealing is done in twelfths. Everything seems to come by the dozen. Roses, Eggs, Donuts, Hotdogs... the twelve pack. AY one time in the faire land of ours there were twelve Pence to a Bob. But still... stock-rooms and ware-houses gravitated towards twelve - she is kind of blue collar and punk rock. Twelve Twelves is known (unfortunately) as a "GROSS." Personally (as much as I like twelve) I think think it should be called the opposite of "GROSS" such as a "Cultured." or even... an "Urbane." The word Gross is just... well... gross. Like somebody is doin' "da dozens" with inanimate objects. Drink that much and somebody is getting gross and should likely join a twelve step program. God, I love twelve. twelve! Speaking of God... no religion is complete with out twelve. Where to start? There were the twelve Olympians: Zeus, Hera, Poseidon, Demeter, Athena, Dionysus, Apollo, Artemis, Ares, Aphrodite, Hephaestus and Hermes. There are Twelve shrines where Lord Shiva (an aspect of God in Hinduism) is worshiped in the form of a pillar of light. Not to digress from God but a pillar of light when viewed through a prism has well... twelve colors. 3 Primary, 3 secondary and six tertiary: Red. Vermilion. Orange. Buttercup. (HEY! You can name the tertiaries anything you want) Yellow. Pistachio. Green. Aqua-Velva Blue. Heliotrope. Violet. and Massage Parlor. There are twelve days of Christmas - going from Christmas day to the Epiphany (Jan 6th) which is the date the three wise men reached Bethlehem and the Magi had their epiphany. Mardi Gras Season Begins on the Twelfth day of Christmas. Make of it What You Will that's why William Shakespeare wrote Twelfth Night. King Author ruled over twelve lands and had twelve knights of the round table. I won't bore you with their names other than to say I always liked the name in a medieval tale "Sir Lance-A-lot." Which would be like a modern action hero named I dunno "Sergeant Taser-Often." There are twelve months in a year - and two sets of twelve hours in a day ie twelve numbers on a clock... even if you are like me and learned to tell time with a digital watch. For similar reasons there are twelve inches in a foot. Not to mention Twelve feet on a musical sextet. In both the eastern and western astrology there are twelve zodiac signs. Though you have to keep in mind that the Chinese calendar runs on a lunar time table - making the new year in February. I went for years thinking I was a Dragon - which seemed cool to me - but then (because my birthday is in January) I found out I was a rabbit. Jen is Welsh (where the national symbol is the Red Dragon) - so that was very disappointing to her - until I pointed out what a rabbit does as it's primary defense mechanism. At the dawn of the modern American Football era all the cool quarterbacks wore number twelve. Nameth, Stabler, Staubach, Griesie, Bradshaw, Brodie, Kelley but they all got their numbers retired and only Tom Brady can still wear it now. In Seattle they didn't have a quarterback to wear it - they just retired the number on general principle. No, not really they retired it because the crowd is known as "The Twelfth man." and Seattle's best player seems to be in the stands. Roger Clemens, Wade Boggs and Roberto Alomar wore number twelve in baseball. In Canada they have twelve players on the football field - but what can you say about a culture that calls a twelve pack a case? But their beer is stronger so what are ya gonna do? The Beatles released twelve twelve inch albums (really). Leadbelly played a twelve string guitar, but never with the Dirty Dozen Brass Band. There are twelve stars on the flag of the European Union. And finally, they say it is the highest one syllable number - though being a southerner it seems to have three syllables Twa-ALE-Va. After twelve it's all co-dependent numbers like "Eight-Teen, and Twenty-One and Three-Hundred-Forty-Five. So, enjoy it 12-12-12! It is going on 12 O'Clock so I better send this out! Jen and I are well. I am taking some well needed time off from performing every day to work on some new material as well as some other projects. Congratulations to Amy Sue Berlin and Mike Meadows! I wish you the best because well... you are the best. It is a brand new thing a ma jig and very cool - check it out - there are samples and everything! I set it up and then have not done much with it. So if you will go there and like it - I will begin posting songs and videos and all kinds of fun and inspiring stuff there - I promise. Jen Delyth, Anne Feeney, The Berkeley Slam Poetry Series, The International House of Poetry, Amy Sue Berlin, Sebastian, Felinzio, The Bodega Boys, Collen and Jane, The US Postal Service, Jim, Catherine and Zoe Infantino. I am taking some time off - but am looking at doing a little mid atlantic thing in the early May. drop me a line if ya want in.